I took some time off the project after an intense period of work, but I'm back at it and it's going well. Most of the work has been focused on trying to finish up the HUD and making it practical. The HUD in the screenshot above is for equipping gadgets in game (the player has two equip slots). The preparation screen is now functional. 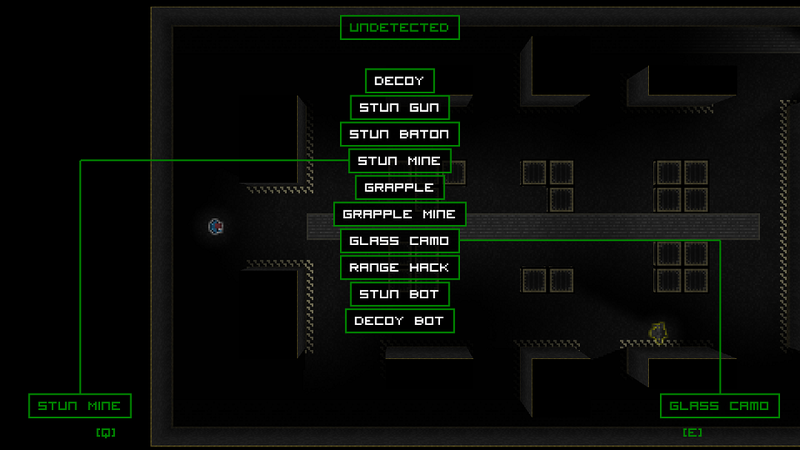 The player can choose two passive gadgets here, and the screen displays information about the gadgets. Usable gadgets are now swappable in game (before they were chosen on the prep screen, but decided to let the player use all of them in game. A variety of bug fixes. All the systems are jamming quite well together! I feel like I'm finding a visual style for the HUD that works. It's really simple, but reminiscent of old computer monitors. I'm still open to changing it though, it might be a bit too simple. After watching the title card from the last devlog post, I'm pretty sure I don't like it anymore. So I'll see if I can muster up something better. I feel like I'm going to add a few more gadgets before starting proper work on the levels. I'm having some serious thoughts about making a separate level editor. This would be really cool to release with the game as well, but it's a huge amount of work. On the other hand, making levels right now includes several layers of tiles, collision masks, lightning etc. If I can make all those things automated and export levels with a separate editor, that would ease the level making process in the long run. I'm really anxious to release the game within a year, but I try to keep in mind that I have time. Plenty of it!